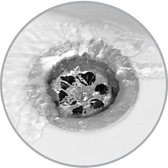 After years of use, it is common for a garbage disposal to quit working and need to be replaced. Once you have purchased the proper disposal that you is needed; it is important to turn off the power. Find the electrical breaker that controls the disposal and power it off. Then check the new garbage disposal to make sure the amp will work for the type of breaker that runs the electric to the device. Checking the amps will ensure that the new disposal will not over power and malfunction once it is turned on. Garbage Disposal Replacement in Scottsdale, AZ, you will need to disconnect the unit from the drain arm. Take a pair of pliers to loosen the drain tubing and the remove it from the disposal. When removing the old disposal system from the mounting nut, it is easiest to twist it off. Drain any excess gunk and water. Then turn the device upside down in order to take off the plate by removing the electrical wiring connectors. Remove the ground screw and wiring fasteners to remove the cable from the disposal. The mounting ring will need to be unscrewed in order to push the flange drain through the drain hole. Before Garbage Disposal Replacement in Scottsdale, AZ, locate the bottom of drain flange and place the rubber seal on it. Push the drain in the location where the drain hole is located. Attach another rubber seal on the flange for the drain under the sink. Connect the metal backup ring with the flat side upward. Attach the mounting ring with the screws, but do not tighten it. Push the ring upward and attach it using the snap ring. Now tighten the mounting screws once it is evenly in place. Connect the electrical wires and ensure they are secure with wire nuts. Hang the disposal and ensure it is aligned properly in place. Turn water on to ensure it is not leaking and then turn the power back on to the disposal.